Claudia Diaz works as a Human Rights Officer in the UN’s Joint Office of the Special Adviser on the Prevention of Genocide and on the Responsibility to Protect. Prior to this position, she spent 12 years working with the United Nations in different conflict and post-conflict countries, including Guatemala, Nepal, Sudan (Darfur), Timor-Leste and in Venezuela. Her work has focused on issues related to international human rights and humanitarian law and her duties have included advising and building the capacity of national institutions, monitoring the implementation of peace agreements, as well as investigating serious human rights violations and abuses, including those amounting to atrocity crimes. Diaz has also held positions as adviser on human rights issues to the Portuguese Ministry of Foreign Affairs and the National Human Rights Institution in Afghanistan. She has an advanced degree in Law and a Masters in Human Rights and Democratization. 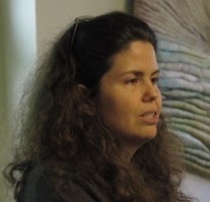 Ms. Diaz served as an instructor at AIPR’s Lemkin Seminar, Global Edition, in November 2012 and December 2013.